There is something very satisfying in driving a fast car through a road covered in leaves with the autumn sun breaking through the trees. I’m still trying to figure out whether it’s more satisfying than just about making a late corner on a treacherous snow covered back road or sending waves of water up in to the air as I hurtle through a rain-covered ditch. That’s the beauty of the latest Forza open world game, though, you can witness all of this and more. The fourth Horizon game finally comes to Britain, the home of the Developers, Playground Games, after taking on the US and Australia. It manages to sandwich in several parts of England, Wales and Scotland in its rather tangled map of roads, motorways and paths but the essence of these countries is captured with finesse. Playground are, rightly, proud of the season based approach and have created an interesting way to see it all right at the start. My initial trip across the part of England that was unlocked took in all four seasons one after another, then spread them out by earning enough points to turn the clocks forward. After another trip through Winter, Spring, Summer and Autumn, the game slows this down to a weekly change, giving you online and offline events that you can choose to enter each time the season rolls around, but ensuring that all four get a much longer period of time for you to race around in. While much of what Horizon 4 offers in terms of modes and races has been seen before, this isn’t a bad thing. The events come thick and fast, interspersed with speed traps and wonderful jumps, plus special events that include facing off against the Flying Scotsman and taking the wheel of a Warthog as Master Chief. Seasonal races ensure that there is always something new, though the clock in the corner for these races counts down to the end of the season, so you need to be aware that they’ll be gone in days if you want to catch them. Currency comes in the form of credits, earned from skills in free roam, winning races or completing events. Currency plays a part in gaining new cars, as you’d expect, but it’s fairly laid back and easy enough to earn enough money to gab a few decent cars. The auction house helps with grabbing a bargain and you can even win some pretty amazing cars from spinning the Wheelspin, grabbing tokens for this from your driving, completing races or buying certain houses. Ah, yes, you can now buy houses and even castles, which act as mini-hubs for organising your car collection, fast travel and more. I’d love this to have been expanded a little, giving you some design decisions over your newly bought house, but then this may well have detracted from the racing. 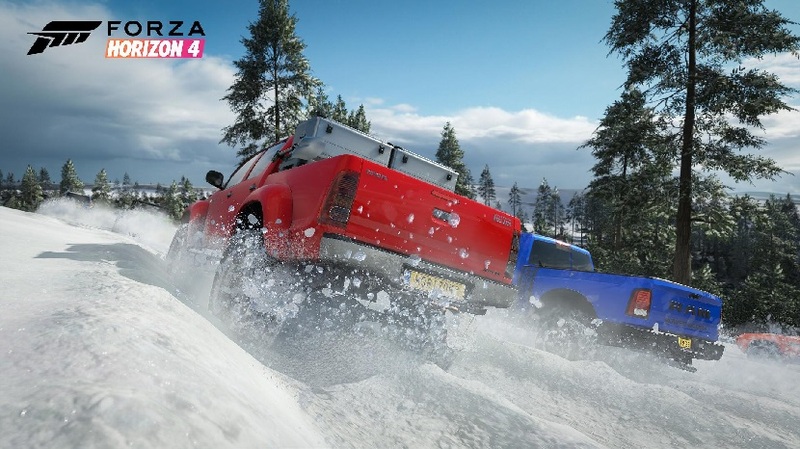 The Horizon festival provides the structure to the game, grounding it in a race to get to the top spot via impressing your fans and completing the levels in each discipline, from drifting to off-road. That doesn’t mean you need to follow the structured path, though. The Horizon games are not just open world but open plan, too. You can simply drive around and take in the beautiful scenery, from beaches to cliff tops and everything in between, or collect cars and perform dangerous driving in free roam to earn points that can unlock new skills or spins on the two wheels. Forza Horizon 4 feels like more of a complete package than any Horizon game before it. The Seasons are the star, though, with some of the most glorious vistas and wonderful moments I’ve ever witnessed in a racing game. In other racing games, being made to stop your car and look around might be seen as a failure, in Horizon 4 it’s part of the charm.